to the brink of civil war. in decline, he has just capitulated and resumed eradication. COLOMBIA: DECRIM OR CIVIL WAR? now in Mexican border cities, most notably Tijuana. Colombian government in cooperation with the DEA. Revolutionary Armed Forces (FARC) guerillas are "the new cartel." insurgency is beating back the army, especially in the Amazon. war" against the FARC and rival drug gangs, "cultural cleansing"
army leads the hemisphere in SOA graduates. through the Colombian Amazon to halt eradication last August. alternatives such as decriminalization and harm reduction. harsh criticism by Colombia's conservative press. PERU: BACK TO THE BRINK? is bringing Peru back into the Drug War fold. at US behest--although they resisted demands for aerial spraying. fed off the eradication campaign. Lima sent in the army. mysterious leader "Chairman Gonzalo" arrested. coca paste flights are by former Peruvian military pilots. portrays the Shining Path as a "narcoterrorist" organization. dismissed for protecting narcotics and weapons trafficking. their biggest attacks in years. levels of chaos are now approaching those of Colombia and Peru. Patrol Mobile Unit (UMOPAR) in Chapare, leading to seven arrests. had been shot in the back from the air. Cardoso has called for a national debate on decriminalization. military and US State Department. US mayors and police chiefs to coordinate anti-drug strategies. which backs the pro-enforcement Stockholm Resolution. 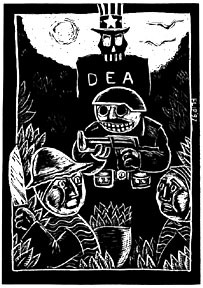 Drug War dissent to South America. ranks with Washington's War on Drugs.